The U.S. Meat Export Federation and the Beef Checkoff have been promoting beef in key overseas markets for years. For 2018, beef demand — both in export markets and here at home — has been an important factor in keeping cattle prices healthy. For the future, however, the question is this: Will key export markets like South Korea and Japan demand more transparency and traceability from U.S. beef producers? Editor's Note: This is part 3 of an ongoing series. Read Part 1 here and Part 2 here. Lively, who at the time was USMEF senior vice president for trade access, was speaking at this year’s annual conference of the National Institute of Animal Agriculture (NIAA). The meeting focused on the need for a standardized national livestock identification and traceability system, one more comprehensive than the current mandatory Animal Disease Traceability (ADT) program. “If you look at the major beef trading countries around the world, the U.S. stands out as a country that hasn’t taken steps to implement a relatively robust approach to traceability,” Lively says. His comments echo observations of the Comprehensive Feasibility Study: U.S. Beef Cattle Identification and Traceability Systems released early in 2018 that was conducted by World Perspectives Inc. (WPI). It was commissioned by the National Cattlemen’s Beef Association (NCBA) as part of the Beef Industry Long Range Plan. With the exception of the U.S., Lively explains, the top 10 beef-exporting countries in the world have traceability systems. Most are mandatory, requiring individual animal ID and the use of ear tags, applied before cattle leave the birth premises. Most require recording movement throughout the individual animal’s life. In every case, data are held in a central database, be it private, public-private or government. Along with the U.S., the top 10 beef exporters are: Brazil, Australia, New Zealand, Canada, the European Union, Uruguay, Paraguay, Argentina and Mexico. Last year, the U.S. exported 2.8 billion pounds of beef worth $7.3 billion, which represented just short of 13% of U.S. beef and beef variety meat production, according to Lively. Over half of the volume (59%) went to Japan, Mexico and South Korea (Figure 1). From January through July this year, exports accounted for 13.5% of total beef production, compared with 12.8% for the same period last year. “I think increasingly, exports are seen as a critical component of the future health of this industry,” Lively says. So far, the U.S. has been able to satisfy international customers demanding higher levels of traceability or verification via USDA’s Export Verification programs (EV). These programs require suppliers to meet requirements with what’s known as a Quality System Assessment program (QSA). Further, individual companies document and certify specific product claims via USDA Process Verified programs. This is how source and age were verified to make beef eligible for export to Japan following the 2003 discovery of BSE in the U.S. It’s also how U.S. exporters were able to comply with China’s traceability demands and re-enter that market after 13 years. Collectively, Leann Saunders, president and co-founder of Where Food Comes From Inc. (WFCF), says she would put these U.S. programs up against any of the mandatory traceability programs used by other exporters. The reason is that, while voluntary, these U.S. programs demand discipline to adhere to requirements. Lose your credentials, lose your market. The effectiveness of mandatory programs depends, in part, on enforcement levels. Saunders is also a past USMEF chairwoman. Customers for U.S. exports could demand more in the way of traceability, however. “Key U.S. export markets have domestic traceability requirements, and it is important for the U.S. to be aware that these countries, or major customers in these countries, could decide to extend this requirement to imports,” according to the WPI study. Another possibility that would force the U.S. into a mandatory traceability system, according to Lively, would be if countries importing U.S. beef that have mandatory livestock identification and traceability systems decide to demand the same. Related to that, Lively could see consumer pressure driving nations to demand higher levels of traceability from exporters. For that matter, major customers in the U.S. could make the same demand of domestic beef. Some major U.S. retailers and restaurants are already at least a few years down the road of adopting product claims that require further verified documentation of the beef they buy. Think here of things like “antibiotic-free,” or some definition of sustainability. For perspective, consider the proliferation of SKUs in grocery stores. SKU is the acronym for stock keeping unit, but think of each SKU as a distinct item. “A conventional supermarket of 30,000 to 50,000 square feet will carry 250,000 to 300,000 SKUs,” says Don Close, RaboResearch Food & Agribusiness (RRFA) senior protein analyst. That’s according to an RRFA study exploring what the beef industry needs to do in order to remain relevant in the online shopping world. He added that retailers can choose from more than 3 million SKUs. Within the last year, Saunders asked why her local grocery store, part of a national chain, was closing for renovations. It was because they needed to add 10,000 more SKUs. Saunders explains identity preservation and traceability are an inherent part of messaging around product attributes and differentiation. That messaging includes where the food came from, how it was grown — and more specifically, the people involved. “You have this new generation of millennials who really care about messaging and where their food comes from. They view food as medicine,” Saunders says. It drives the supply chain to further differentiate products by attribute, and provide that information to consumers. Moreover, she points out that increasingly, more consumers are further away from food production, generationally. That increases their demand for knowing more about the food they consume. The result is a sort of a vicious spiral staircase: The more differentiation occurs, the more consumers want; the more attribute verification that occurs, the more that’s needed. Along the way, some cattle producers find more revenue potential in verifying attributes demanded by consumers (see Figure 2). WFCF tracks prices paid for calves and feeders that trade through Superior Livestock video and Western Video Market auctions. Arguably, outside of direct trade, that’s where most cattle are acquired that comply with specific value-added program certification requirements. 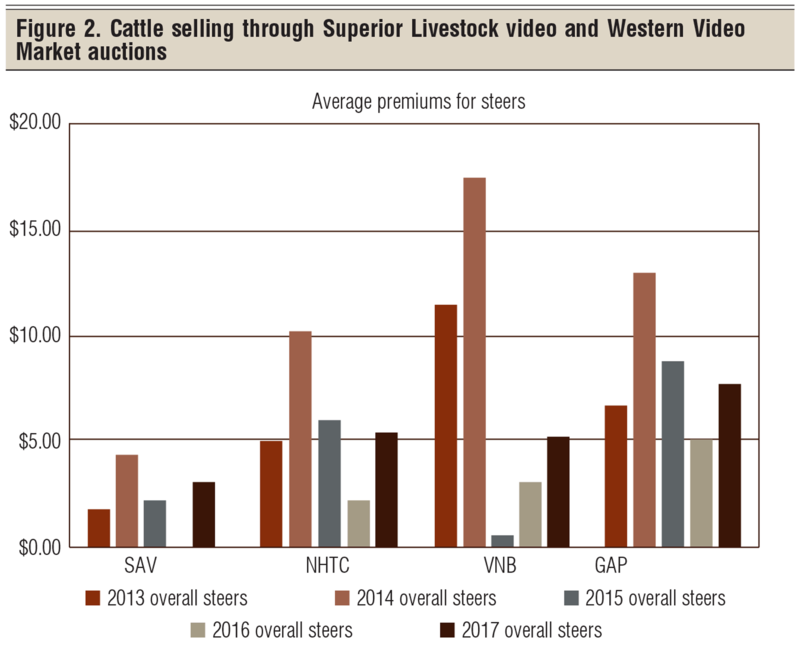 Through the first half of this year, source and age verification (SAV) demanded a $3.72 per cwt premium for steers in those sales, compared to same-weight, same-class cattle without the designation selling in the same region. SAV steers that also could be verified as non-hormone treated cattle (NHTC) brought $7.32 more. Those verified for Global Animal Partnership’s (GAP) five-step animal welfare rating program commanded $15.05 more. Verified natural beef (VNB) earned a $5 premium.